Want to be notified of new releases in chijuiwu/eaglesense? EagleSense is a top-view tracking system that leverages a depth-infrared hybrid sensing pipeline for real-time human activity and device recognition. It provides a minimalistic RESTful API that can be used by ubicomp applications (e.g., proxemic-aware or cross-device systems) in interactive spaces. 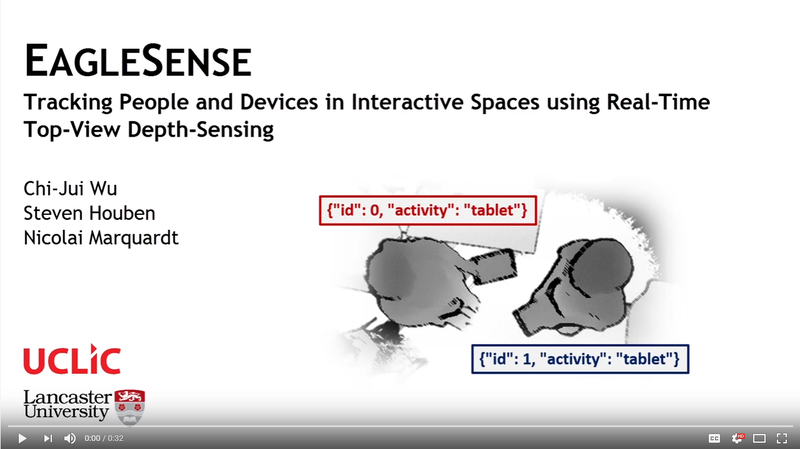 EagleSense: Tracking People and Devices in Interactive Spaces using Real-Time Top-View Depth-Sensing. In Proceedings of the 35th Annual ACM Conference on Human Factors in Computing Systems (CHI'17). Install Git (and Git Desktop). Install Visual Studio with Visual C++. Install Microsoft Kinect v2 SDK. Download Boost C++ Libraries windows binaries. Download OpenCV 3 windows binaries. Install Python 3 (The Anaconda distribution will contain most of the Python requirements. ), also see requirements.txt. Follow this installation guide. Download XGBoost.dll and then install the Python package. Set the following system environment variables. Add %OPENCV3%\build\x64\vc15\bin, %PYTHON3%, %PYTHON3%\Scripts to PATH. Open the EagleSense project /path/to/eaglesense/eaglesense/topviewkinect/topviewkinect.sln. Set solution configuration to Release and x64. In the solution explorer, right click the topviewkinect project then select Properties. Include the following fields as needed. Make sure the versions are correct. Open Build then Build solution (CTRL + SHIFT + B). Configure the EagleSense top-view tracking system via config.json in the EagleSense root directory.